This course is intended for parents of gifted students. Nearly all gifted children will experience at least one period of depression. This can arise from their tendency toward perfectionism, creativity, idealism, and passion. These same qualities can be harnessed as strengths to direct a gifted child toward personal growth and success. 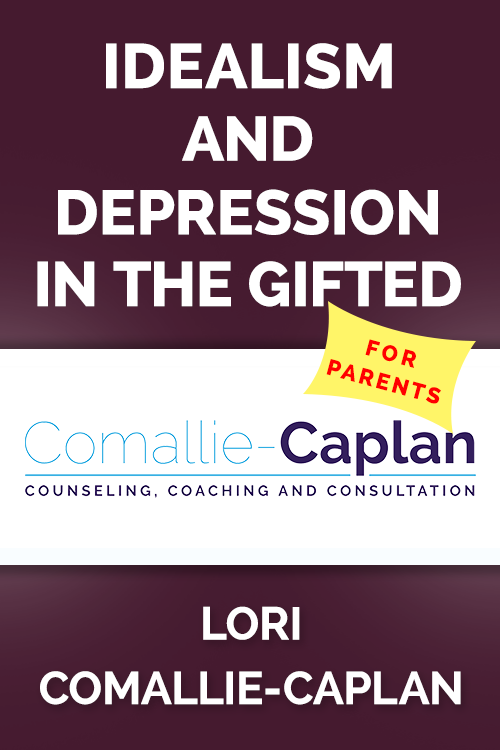 In “Idealism and Depression,” Lori Comallie-Caplan discusses the serious issue of depression in gifted children. Many young people experience depression, but what are the unique struggles observed in gifted adolescents? Asynchronous development, social isolation, and existential depression are just a few of the risk factors. Although gifted children are vulnerable to depression, due to their high expectations and idealism, you will find that their strengths can be tapped to help them move toward hope and optimism. Lori Comallie-­Caplan is a New Mexico Licensed Master Social Worker and a Licensed Educational Diagnostician with a Masters Degree in Psychological Counseling. Additionally, she holds Advanced Certification for Mediation from the University of New Mexico School of Law. Ms. Comallie­-Caplan has 30 plus years of experience in the field of counseling, coaching evaluation, mediation and educational consultation. She is best known for her work with gifted individuals and frequently provides professional development for school districts and mental health professionals regarding the social emotional needs of the gifted.